If you're feeling pretty broke after the holidays, there's good news. One London café is offering free food — but there's a catch. The Run For Your Bun pop-up café, set up by U.K.-based gym David Lloyd Clubs, will be the first café in the world to accept exercise as payment. According to a press release, the initiative is a means to "encourage sedentary office workers to be more active." Customers will be able to choose a free lunch after first completing a six-minute "micro workout" under the guidance of a personal trainer. What will that micro workout entail? 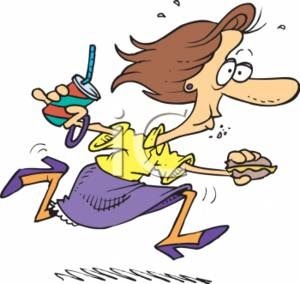 As the press release says, a free lunch will run you a six minute "HIIT" (high-intensity interval training) workout, including one minute on a rowing machine, one minute on a spin bike, and one minute on a treadmill, as well as a minute of sit-ups, bodyweight squats, and lunges. In other words, it's a hell of a workout — but hey, at least you'll be given 30-second rest periods between each exercise. While wanting to give people the chance to be more active isn't a bad thing, this payment method sends a pretty harmful message about food. As we've said before, food is not something that you have to exercise for in order to "earn," and asking patrons to sweat it off before eating a meal implies that food is somehow a reward for a workout and not a necessity. To be fair, the press release states that Run For Your Bun "isn’t in any way about encouraging people to ‘cancel out’ calories through exercise." But it then goes on to emphasize that the workout would only burn off "a fraction of the calories" you would consume in any of the meals, anyway. Ideally, you would be exercising for the sake of health benefits and for how it makes you feel — not so that you can get permission to eat. Wanting to help others become more active isn't a bad thing, but in this writer’s opinion, physical activity really shouldn't be used as a currency for someone to "purchase" a meal.